New Quay NS opened its doors on the 14th April 1975. It was an amalgamated school. Two schools – Turlough National School (which is now part of the Outdoor Education Centre) and Ballyveleghan National School closed their doors when the new school opened. At that time there were 70 children enrolled. The teachers in the new school were Martin Barrett, Eileen McMahon and Joan O Loghlen. Martin Barrett was the Principal and he was replaced by Michael O Connor. When Michael O Connor returned to his native Miltown Malbay he was replaced by Mathew Barrett (a brother of Martin Barrett). Other teachers in the school down through the years were Anna Carruchan, Josephine Colfer, Eileen Fleming, Joanne Stephenson (a visiting teacher from Canada who spent a year teaching in the school in 1999-2000) Emma O Sullivan, Mary Quealy and Jean Healy. The teachers in the school at present are Carmel Thynne, Mary Reidy and Ashling Dillon.There is a long tradition of learning in the area. The O Dálaighs operated a Poetry school in Finavarra. According to tradition the Ó Dálaighs originated in what is now Co. Westmeath but by the beginning of the twelfth century they had already dispersed to form the separate branches that attached themselves to local rulers in Clare, Meath, Sligo, Roscommon, Breifne and Cork. TheFinavarra Ó Dálaighs are said to have descended from Donncha Mór O’Dálaigh, who died in 1244, a poet celebrated for his religious compositions. Aodh de Blacam has described him as the greatest religious poet in the Early Modern period. This particular branch were poets, first to the O’Loughlins of Burren and later to the O’Briens. The annals give the obituaries of several Ó Dálaighs called ollamh le dán (“professor of poetry”) of Corcomroe. In the historian O’Donovan’s time the ruins of the Ó Dálaigh school at Finavarra and the garden walls were still to be seen. 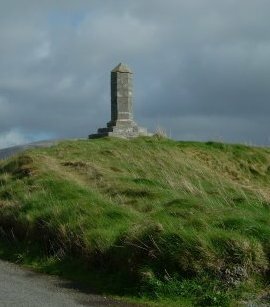 Today the site is marked only by a curious stone monument or leacht dedicated to Donough Mór Ó Dálaigh. According to the Irish Education Survey of 1824 which was conducted before the introduction of the National school system in 1831 Thomas Scanlan was listed as being a hedge school teacher in Tinavara ( which was probably Finavarra) . His annual income was about 26 shillings and the schoolhouse was described as a miserable hovel. 66 children attended this school, 65 Catholics and one Church of Ireland.